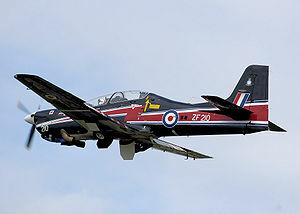 The Short Tucano T1 (S.312) is a two seat turboprop basic trainer used by the Royal Air Force. It is a licence-built version of the Brazilian Embraer EMB-312 Tucano, and is also used by the air forces of Kenya and Kuwait. 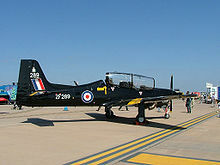 The Short Tucano was developed by the British Short Brothers company in order to meet a requirement to replace the Jet Provost as the basic trainer for the RAF, as laid down in Air Staff Target 412. It is an adaptation of the Embraer EMB-312 Tucano fitted with the more powerful 1,100 shp (820 kW) Garrett turboprop engine in place of the EMB-312's 750 shp (560 kW) Pratt & Whitney Canada PT6 engine, to give higher climb performance. A new cockpit layout similar to the Hawk advanced trainer. A four, as opposed to three, bladed propeller. Ventral airbrake and restyled wingtips. The fitting of Martin-Baker MB 8LC ejection seats for both crew. The Tucano was selected in 1985 in preference to the Swiss Pilatus PC-9 and the British Hunting Firecracker. The first Garrett-engined Tucano flew in Brazil on 14 February 1986, with the first Shorts built production aircraft flying on 30 December 1986. The decision to replace the 750 PT-6 engine used in the standard EMBRAER model with the 1,100 shp (820 kW) Garrett TPE331-12B engine and "bird-strike" proofing of the cockpit canopy to UK standards (combined with the fitting of Martin Baker ejection seats) caused a number of problems which delayed the introduction of the aircraft into service until 1989. Since first deliveries to the RAF in 1989, the Tucano has been operated primarily from No 1 Flying Training School at RAF Linton-on-Ouse to provide basic fast-jet lead-in flying training to RAF and RN student pilots. The deployment is officially to 72 (Reserve) Squadron, 207 (Reserve) Squadron and 76 Squadron (Tucano Air Navigation Squadron). Student pilots fly around 130 hours during their training course on the Tucano before progressing to the Hawk T1 aircraft at RAF Valley. In service the Tucano has proven to be 70% cheaper to operate than its predecessor. With a greater range and endurance than the Jet Provost, it can fly two consecutive sorties before being refuelled. One of the key performance requirements was that it can climb to 15,000 ft (4,600 m) in six minutes, in comparison to the Jet Provost's 15 minutes; this gave considerably more training value for each one-hour sortie. Picture - Short Tucano T1 at RIAT 2005. Two-seat basic trainer for the RAF.